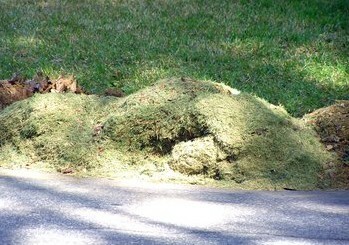 Is that how he’s going to kill us in 2012, buried under mountains of lawn clippings? Randal, I think you are mixing your ancient cultures. Quetzalcoatl was Aztec. It’s the Mayans who are supposed to get us in 2012, I think. I’m doing this without looking it up, so it is totally within the realm of possibility that I am the one that is wrong. I don’t think this is as totally unconnected, especially on Tuesdays, as one might suspect. Quetzalcoatl might have had a lawn…. I best watch what I drink…… I’m starting to see the connections. That Aztec creature is yours. This pile of clippings is Mayan.